Who hasn’t had a laundry disaster at least once? Doing laundry requires time and patience, and sometimes we just don’t have enough of either. Here’s how you can tackle some of the laundry problems you may face. We’ve all let the heat get to our clothes at some point while ironing them. What this results in is ugly scorch marks or worse-burnt holes in our favorite garment. A handy tip to get rid of the scorch marks is wiping the affected area with distilled white vinegar. For heavier marks, you might have to use a mild bleaching agent such as hydrogen peroxide or household ammonia to get stain off. 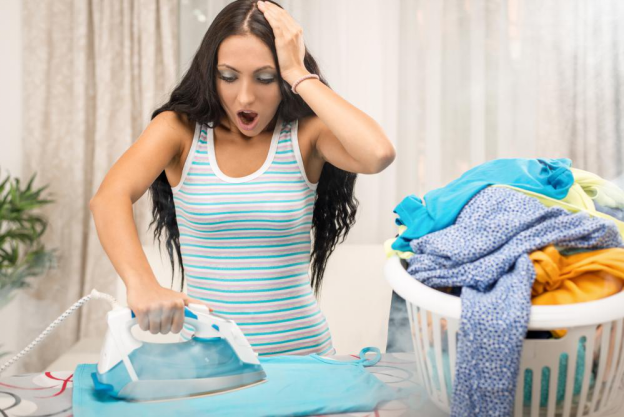 While these are quick solutions for emergencies, always be sure to adjust the temperature of your iron before you began pressing clothes to avoid nasty burns and marks. If ironing in bulk, hire an ironing service to take care of your clothes to have them looking fresh and clean and spare any accidents! When doing your laundry at home, you may notice that your clothes are coming out smelling musty despite you adding sufficient amounts of detergent. This is usually the case with front load washers which use less water to clean the load of laundry. However, these washers often develop and hold unpleasant odors due to improper use and cleaning. This can happen when residue from detergents and fabric softeners clings to the inside of the machine, especially if you leave damp clothes in it for a few hours. It’s important that you clean the washer at least once a month using hydrogen peroxide or a chlorine bleach to avoid musty smells. However, this too can be a hassle if you have a lot of laundry to clean, in which case it’s best to hire a professional cleaning service to take care of your laundry for you! Don’t you just hate it when you take out your clothes from the dryer and find tiny specks of fibers all over them? This is a mistake people often make when doing their laundry at home, mixing their towels and dish cloths with other types of fabrics. If you want to avoid having to run multiple cycles for the different types of linen separately, why not use a cleaning service to do the job just right? That way, you will get all your garments clean and speck-free and will also be saved the trouble of running separate washing cycles at home. It’s super convenient! It’s good to know tips and tricks for your laundry problems to take care of emergency situations but for best results, always have your clothes cleaned professionally. Stubborn stains, scorch marks, unpleasant odors; there’s nothing a laundry service like International Professional Cleaners can’t fix!